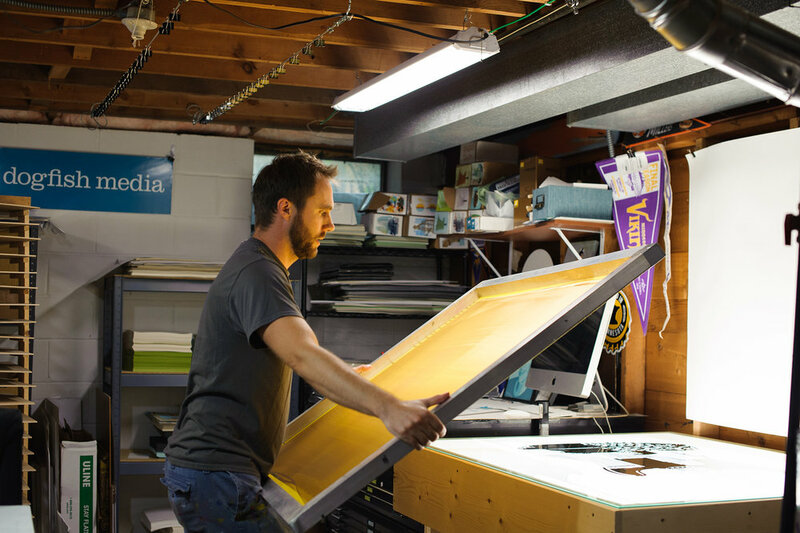 I was commissioned by the Minnesota Vikings to create large screen prints to be installed in U.S. Bank Stadium as part of the permanent Art Collection. 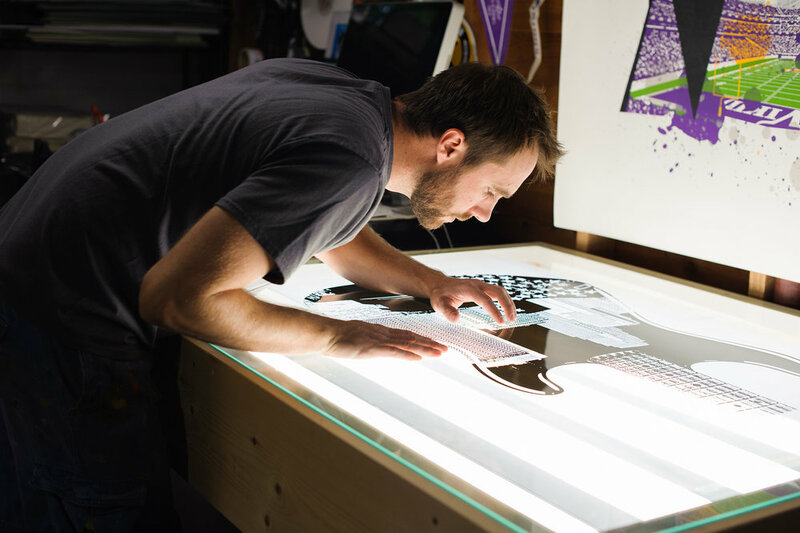 This was an incredible opportunity for me as the project combined two of my favorites passions: Minnesota Vikings football and printmaking. Scroll down to explore the journey that was roughly 16 months in the making. Thank you and SKOL VIKINGS!!! SERIOUSLY, THE VIKINGS AND ART? The Minnesota Vikings hired Sports and the Arts (SATA) to curate the art for U.S. Bank Stadium. 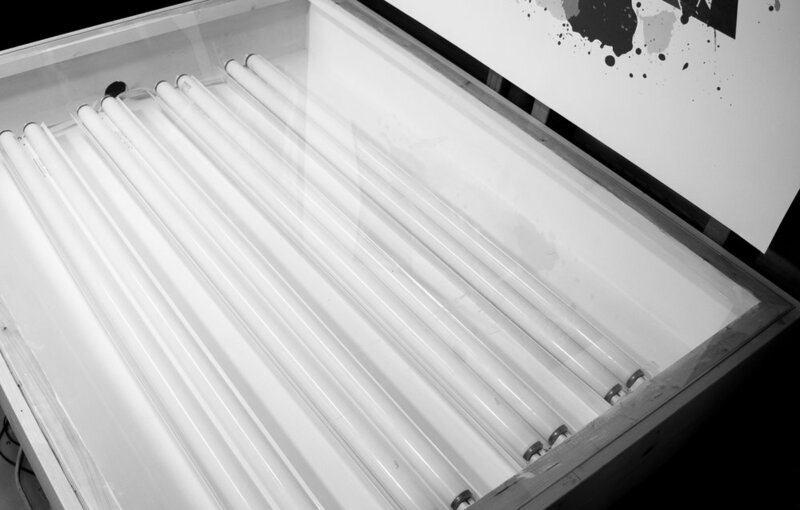 This process began during the winter of 2015 when SATA held an open call for artists. Though I thought it was a long shot, I put together a portfolio and submitted my screen prints. Nearly 1100 artists applied to be considered for the collection. Of those submissions, 33 artists were selected to create works exclusive to the stadium. And of those 33 artists, only one printmaker was selected (me!). Above is a video that shows some of the artwork on display during the initial presentation by SATA to the Vikings Organization. Read more about the selection process and Art Collection here. In September of 2015 I received a call from Sports and the Arts. They said I had been selected as a stadium artist and were looking to have two designs created and screen printed at 36" x 48". I was extremely excited and honored to be part of the collection. After I hung up the phone, I kind of had an "oh crap" moment as my current studio configuration would not allow me to print at the size. It wasn't a matter of if I could do it, but how I could do it. I knew I would be able to rebuild all of my equipment, but it would take a lot of planning, research, brainpower and assistance. It was time to get to work. In order to screen print the large artwork, I had to rebuild my entire printmaking studio. Every piece of equipment needed to be quadrupled in size. 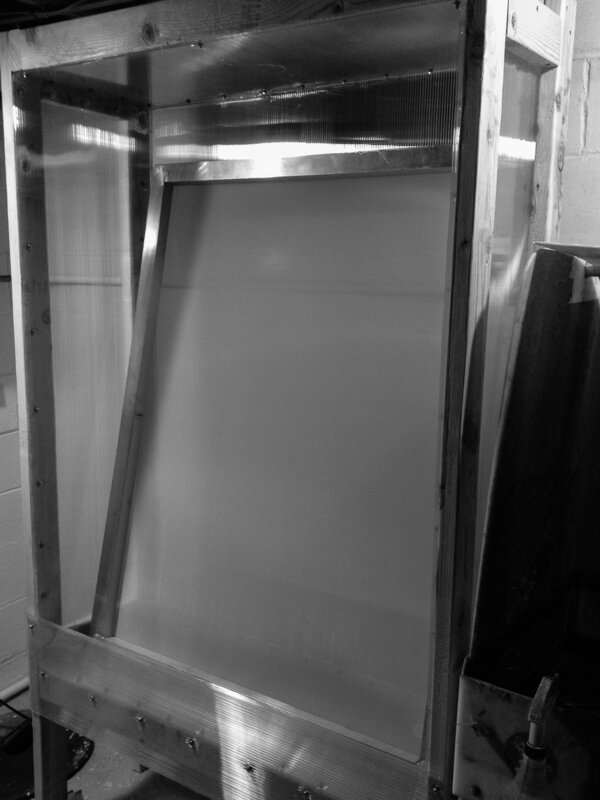 This included a printing press, exposure unit, washout booth and drying rack. To assist me, I called in an expert craftsman and builder. That would be my dad, Mark. After quick sketches, I designed some digital concepts (pictured below) that illustrated what I needed. Once we had a plan, we went to work in my dad's wood shop in Detroit Lakes, MN. This was the exact place I grew up. Without my dad's help and expertise, I never would have been able to create such functional equipment that didn't break the bank. While still working through building and installing the equipment, it was time to turn my attention to the artwork itself. The commission called for two designs. One design was to focus on U.S. Bank Stadium, while the other was to integrate music and the city of Minneapolis. Like every design project, I started with many quick pencil sketches. Its a great way to try different subject matter, compositions and texture without focusing on any details. This is a foundation of good design. After the sketch process, I moved towards creating digital concepts. This involved getting out in the field to photograph components that would appear in the print. So I grabbed my Nikon and headed downtown. Here I shot several views of the Minneapolis skyline and First Avenue music venue. Another piece of the design involved making the ink spots. I needed to make the ink spots look like, well, ink spots. In order to do that I splattered India Ink on sheets of paper on my studio floor. Once that dried, I scanned them in at a very high resolution and added them to my composition. Since the stadium construction was only 50% complete, I could only use digital renderings as inspiration for that piece. Though limiting in ways, it really forced me to study the available imagery and capture the essence of the facility's design. Vikings fans are proud of their team, their stadium, their history and their state. This piece represents Minnesota pride and all the hard work that has gone into the creation of the stadium. At times the construction appeared quite messy as materials, machinery and equipment were scattered throughout the area. Emerging from all of this chaos is the bold and clean masterpiece that demands attention in downtown Minneapolis and across the world. This is a venue that Minnesotan’s are proud to say is their own. This print is a tribute to the great music scene in Minneapolis. Hundreds of great bands have played at the iconic First Avenue music venue over the last 40+ years. As someone who has attended several concerts there, I can say the atmosphere is always very electrifying. I wanted to carry this feeling through the design and composition. 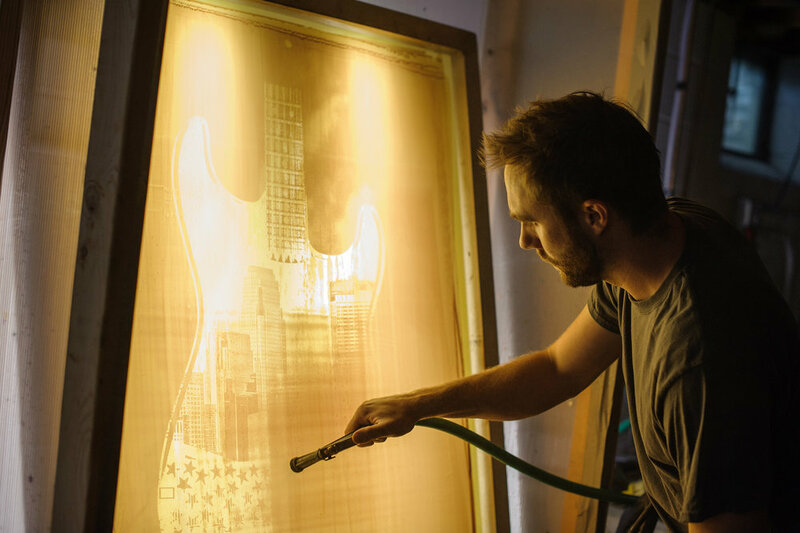 The ink splatters create a dynamic background for the bold electric guitar image that combines the Minneapolis skyline with First Avenue. TWO DESIGNS. TWENTY PRINTS. LET'S GO! Once the designs were approved and all of the studio equipment was built and installed, it was time to go to work (again). This time it involved actually screen printing the final art. When it came to printing this large, I was like a rookie at training camp. I've screen printed thousands of times, but never at this level. A new set of challenges arose when using such large equipment and paper. Soon after I dove into the first run, I felt right at home. The biggest key was to take my time, get everything lined up and then print. Its a good thing I have long arms because reaching the top of the press with the 32" squeegee took every bit of my wing span. Once the ink was pulled, I would carry the paper and hang it from binder clips. Learning to "dance" with such large paper was like poetry in motion. Since I was working with limited space, I needed to make sure not to touch the wet ink or dent the paper. Patience and trying to stay calm were key mental aspects of creating perfect prints. As with all screen print runs, I printed one color at a time on all sheets of paper. After that was completed, I started the process over and printed the next color. Layer by layer I built up the image until the final (key line) layer was printed. Printing the yellow layer of Electric MPLS (12x speed). Printing the black keyline later of Electric MPLS (8x speed). So, where is the art located? The short answer: everywhere. And I'm not referring specifically to my work. A tour through areas of the stadium showed us just how much artwork is on display. Hallways leading to suites felt like art galleries. Each of the six club levels are branded with unique art. The main concourses are given life with large murals, photographs and graphic installations. With over 20 pieces, I don't know for sure where all of my artwork is located. The original screen prints that I created are installed in some suite level corridors and also privately owned suites. A scaled up version of each of my designs are installed in the entry to the Factory Motor Parts (FMP) Club. The pieces measure nearly 12 ft and are massively impressive! Just days prior to the stadium opening, I received a call from Tracie Speca-Ventura (owner at SATA). She said they selected my "Purple Pride" design to be the Inaugural Season Commemorative art piece. Holy crap - what an honor! They issued a limited edition of 3000 giclée prints to be signed and numbered by yours truly. Signing the prints was a marathon event (16 hours!) that I will never forget. The prints were also gold foil stamped with an official U.S. Bank Stadium Inaugural Season logo. A portion of the prints were distributed to guests attending the "Purple Gala". This was a private black-tie party that the Vikings ownership threw to christen the new stadium. The remaining stock will be distributed by Vikings personnel to recipients of their choice. U.S. Bank Stadium Inaugural Season Commemorative Art Piece - 17 x 12.75"
A special thank you goes out to the Wilf family and Tracie Speca-Ventura with Sports and the Arts. Without the combination of these two powerhouses (Vikings and SATA), I never would have been a part of the art collection. I am forever appreciative of the opportunity they gave me to fulfill a dream I didn't know existed. Additionally, an extra special thank you goes out to my incredible wife, Annie. Her unwavering support and enthusiasm fueled me from start to finish. She also was a great (and patient) sounding board as I endlessly discussed the project and the challenges I faced along the way. Did I mentioned we had our first child (Charles) during the middle of this project? Yeah, she's awesome. I would also like to thank my parents, Mark and Sue. Their contributions played a key role in the project. From the skilled craftsmanship that my dad contributed in building the equipment to the keen creative problem solving that my mom brought to the table. I am forever grateful to have such helpful and supportive parents. And finally, thank you to everyone who extended their support and positive feedback once the project was unveiled. I am truly blessed to be surrounded by such great friends, colleagues, Vikings fans and Minnesotans. SKOL!! !